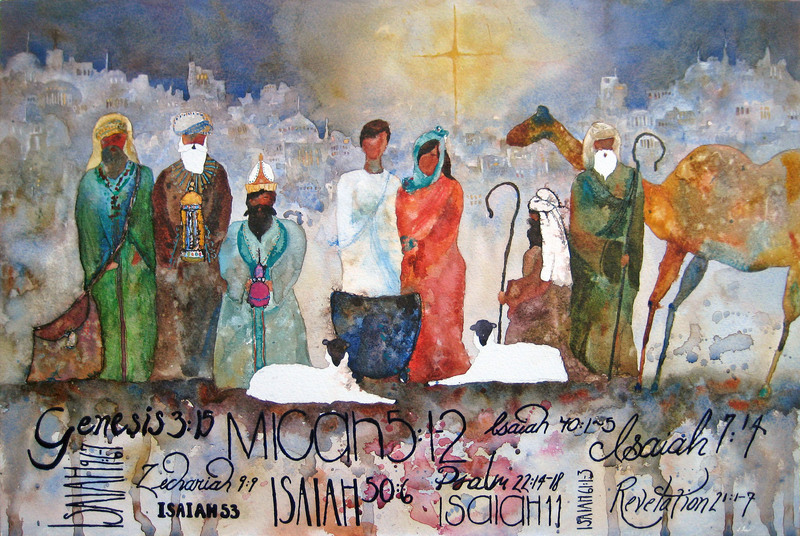 The Lord gave me the idea to do a nativity painting this Christmas and this is what He poured forth from my brush. He gave me the idea to add some very important Scripture to the bottom of the painting to be used as a devotional tool for families. The Scriptures are all prophecies (beginning with the very first prophecy about Jesus – Genesis 3:15) about Jesus’ birth, ministry, death, resurrection, and the final Scripture is a prophecy about His second coming (Revelation 21). My prayer is that this will be a tool for families to use throughout the month of December to get into the Word together. Sometimes the only place people know to turn to during this time of year are the gospels – which are a great place to read, don’t get me wrong – but there’s SOOOOOOO much more about Jesus and what He came to do throughout the WHOLE bible – especially in the Old Testament. So, please feel free to use this list of Scripture and sit down with your family this Christmas season and savor what was foretold about Jesus’ life and death LONG before He ever stepped on earth. The details of these prophecies are mind boggling. I pray you would find His Word to be sweeter than honey – maybe you’ll even “taste” some things you’ve never seen before in His precious Word! Merry Christmas! You can click on the picture to see a larger version of it. I love this picture since I saw you working on it at One Man’s Treasure. It is beautiful, and the verses at the bottom add so much to it. Sandi- what a beautiful expression of our Savior coming to earth!!!! God has so gifted you and this has so encouraged my heart today! Thank you! Since Im now in East TN…and I never can seem to get to H’ville to go buy your stuff-do you have a website where I can do that? I need a special Christmas present for a someone special who’s a man! 🙂 Love you sister and thanking the Lord Jesus today for your gift to all of us! Thank you Nancy! I’m blessed that you were encouraged today! There’s not a website where you can buy my art (not yet anyway – I am thinking about doing that sometime soon though). I’ll contact you about how you can purchase them though. There it is! Just beautiful, Sandi! Do you sell your paintings? Is there a price list somewhere? Barbara, I do sell my paintings. I have a sale at my house a few times a year. I have also shipped paintings to customers. We are in the process of moving though and are all packed up. Are you in the Nashville area? If so, I could add you to my e-mail list that I send out when I’m having sales. I found your blog through your sister’s blog and her efforts to raise money for adoption. This is one of the most amazing pieces of art I have seen. I collect Nativity scenes and think this is beautiful. I love your style of work. Is there a place in Hendersonville where your work can be purchased? If so please let me know so I can check it out! Thanks. Hey Anna, thanks for stopping by and thank you for the kind comments about the nativity piece – it’s one of my favorites too. There was a store in H-ville that was selling my artwork but it is now closed. I usually have sales at my house 2-3 times a year but we are in a rental right now (in H-ville) because our house sold in one day and we couldn’t find what we wanted fast enough so I won’t be having any sales this year. I’m not sure what I have in stock but I can check to see if I have any of the nativity prints left if you’d like me to. Feel free to e-mail me at sandigrady@comcast.net.